We are a small group of web professionals who are passionate about the web and all things handmade. 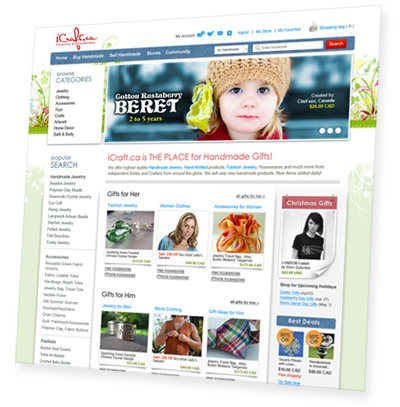 We strive to develop beautiful websites and ways to make selling and shopping online as easy and enjoyable as possible. Our goal is to make iCraftGifts.com a household name for Handmade Gifts. We know that everyone has a creative side. But not everyone is able to showcase their work to the world. That's where we come in. Based in Toronto, ON, iCraftGifts.com exists to connect artists, designers and craftspeople to those who appreciate their work. All Creators of unique, one-of-a-kind items, can quickly setup their stores and take advantage of the powerful marketing services offered. They have the option of showcasing their ready-made merchandise online, and accept requests for custom orders or commissioned work. Visitors to the site can browse our handmade collections, buy products online and have the ability to contact Creators directly with questions or requests. A wealth of content intended to inspire and educate is offered to our Community Members – blog articles, regularly updated Message Boards, art and crafts events and much more. Community Members are encouraged to submit original articles, photographs and event announcements to the site, and connect with other local and international members. iCraftGifts.com is strictly for Handmade Art, Crafts and Fashion creations. We are probably one of a few places that focus on true Artists and Crafters, and make it our mission to showcase their talents. There is a special section on the site listing all Creators of Handmade. We also regularly feature sellers in our “In the Spotlight” blog column and our monthly newsletters. Also, we review all the submitted work and provide Creators with the constructive criticism when we see opportunities for improvements. Because of that, you can generally find a higher quality of products on our site. Looking for a wonderful handmade gift? Browse our Handmade Collections.